1. Preheat your oven to 220C / 425F / Gas 7. 2. Line a medium sized baking tray with greaseproof paper (if you do not have any greaseproof paper just rub a thin layer of soft butter onto the tray ensuring it is well coated. 3. In a large bowl sift the salt and self-raising flour. Using your fingertips rub the cubes of butter into the flower until the mixture resembles breadcrumbs. 4. Add the sugar and milk to the bowl and lightly mix in until all ingredients are combined. 5. Lightly flour the work surface and place the scone mixture on to it. Flatten out the dough with your hand until it is about 1 inch thick. Using a 2 inch cookie cutter or fluted cutter, cut out 10-12 scones. 6. Place the scones on the baking tray and bake in the oven for around 12-15 minutes or until the scones are well risen and a nice golden brown colour. Remove from the oven and place onto a rack until cool. 7. 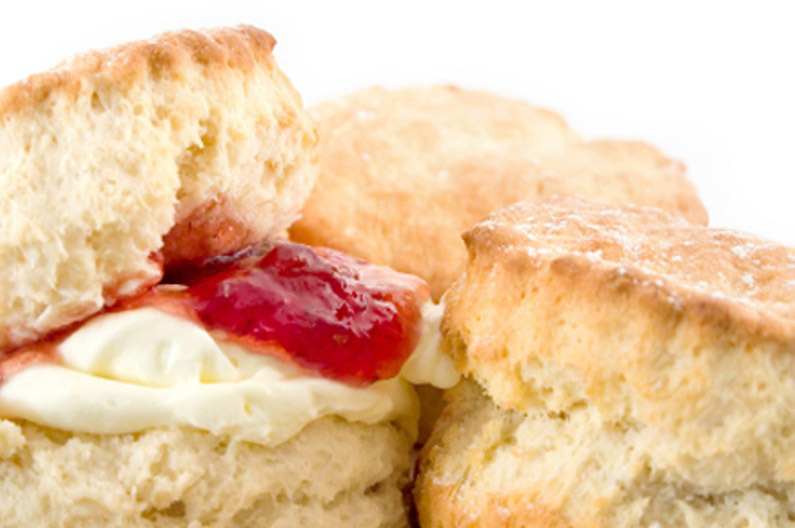 Slice the scones in half when cooled then spoon some clotted cream on each scone, followed by a spoonful of jam. Or if you prefer serve the scones with the clotted cream and jam separately so people can add as much or as little jam and cream as they wish. *If you like sultana scones just add one very good handful into the scone mixture just after stage 3 above. Thank you to Margery for this recipe.